Seat belts save lives. No one disagrees with that. According to the National Highway Traffic Safety Administration (NHTSA), seat belts saved almost 15,000 lives in 2016 alone, which is an excellent reason that Florida law requires all drivers and front-seat passengers to wear seat belts. However, defective seat belts are a serious threat to public safety. When a seat belt fails because of a defect, it can cause horrific injuries and possibly even lead to death. Fortunately, motorists can hold the manufacturer and others responsible for any losses caused by a defective belt. Latch malfunction. The seat belt does not completely attach, so it flies apart during an accident and fails to restrain a passenger. Inability to latch. Sometimes, based on the way a seat belt is manufactured or designed, it is impossible to get the seat belt to latch regardless of how much pressure you apply. Defective release button. After a crash, it might be impossible for a user to release the seat belt. If a car is on fire, for example, an occupant could die before help arrives. Weak materials. These can cause the seat belt to fray or break during a crash. Missing parts. A seatbelt with parts missing will likely fail. Defective mount. 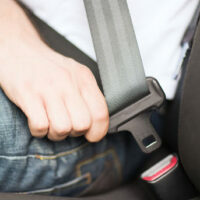 The seat belt could pull away from the wall of the car during a collision. To determine if something is wrong with the seat belt, your car accident attorney will need to have it analyzed. For that reason, you should not have your car immediately fixed after an accident. Instead, keep it in its condition so that a lawyer can check it out. Many injuries occur to the upper body, such as the neck, head, arms, and chest. Since many people instinctively reach out to protect themselves, many people also suffer wrist and hand injuries as well. If a seat belt entirely fails, however, then it is not unusual for someone to be thrown completely from the car. As a result, they can suffer devastating injuries, such as spinal cord damage or traumatic brain injuries. Many victims will also die. Unfortunately, when people are thrown from a vehicle, police often assume the person was not buckled up. In fact, the seat belt might have failed because it was defective. Florida law allows injured victims to receive compensation when a defective product injures them. Seat belts are meant to save lives, not endanger them, and manufacturers should be held responsible for putting dangerous products into vehicles. For more information about how to receive compensation, please contact us today. You can meet with a Daytona Beach car accident lawyer at Bundza & Rodriguez, P.A. who can answer your questions and determine whether you have a viable lawsuit. Please call 386-252-5170 to schedule your free initial consultation.